MECLABS is the world's largest independent research institution focused exclusively on marketing and sales. Our scientists and analysts have conducted rigorious scientific tests across more than 10,000 pages. We have recorded and analyzed more than 5 million calls, and we have conducted interviews with more than 500,000 key decision makers. MECLABS is sharing a selection of these discoveries in our research catalog. The point of this catalog is to provide a simple reference to our research output over the past three years. Its use is very limited (we don’t expect it to be a "bestseller"). However, for the serious practitioner or the interested scholar, it is a window into the work of our institution and may prove helpful as a starting point for new work. 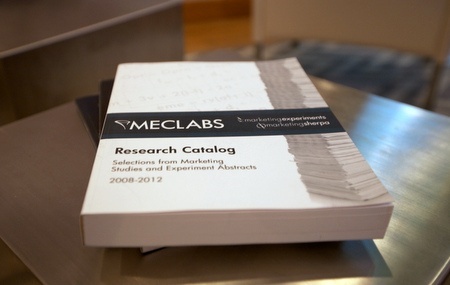 This catalog represents 403 pages of more than 80,000 hours of our MECLABS analysts' and scientists' thoughtful labor. Much of the experimentation published in the Research Catalog was conducted with Research Partners — producing discoveries to share with the marketing community while improving Partners' performances. To learn how MECLABS can help you, read more about our Research Partnerships and provide contact information in the form below. A MECLABS analyst will reach out to you with details on how a Partnership can reveal what your customers really want. We'll ask a few questions about your business to determine how we can best serve you. This includes immediately providing valuable content, at no charge, that addresses your specific challenges.